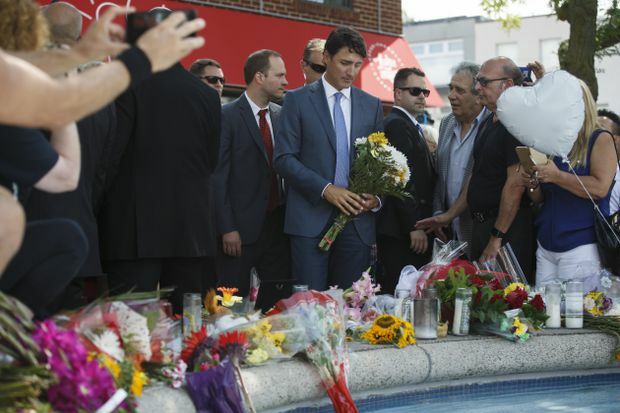 Prime Minister Justin Trudeau arrives to lay flowers at a memorial for Reese Fallon on Danforth Avenue in Toronto on July 30, 2018. Standing 15 metres from the flower-strewn spot where 18-year-old Reese Fallon died by a gunman’s hand, Prime Minister Justin Trudeau said his government remains open to enacting a handgun ban and other measures to combat Toronto’s gun violence. He said his government will study approaches to gun violence in other jurisdictions before deciding on a policy direction. Last week, a senior official told The Globe and Mail that Mr. Trudeau will decide in mid-August whether to pursue a ban on handguns as part of a new legislative agenda he would outline in a fall Throne Speech. Earlier in the day, Mr. Trudeau attended the funeral for Ms. Fallon, who died in a gunman’s rampage on Jul. 22 along Danforth Avenue that also killed 10-year-old Julianna Kozis and injured 13 others. Julianna’s funeral was held in Markham on Monday. The shooter, identified as 29-year-old Faisal Hussain, fired upon pedestrians and restaurant-goers in and around the parkette. He continued shooting as he walked four blocks west along Danforth where he was found dead after a shoot-out with police. Sources connected to his family said they were told by the coroner that he died of a self-inflicted gunshot wound. In the wake of the shooting, Toronto City Council voted last week to ask the federal government to ban handgun sales in the city and urge the provincial government to do the same with ammunition. During a radio interview on Monday morning, Toronto Police chief Mark Saunders offered his qualified support for the idea. Chief Saunders said “gunplay has gone down” since Toronto Police launched a $3-million gun-violence reduction strategy, adding 200 officers to the service’s frontline overnight during the summer months. “From June 14, which is when I started this, we’ve seized over 110 firearms right now,” he said. The amended night shift schedule was announced on July 12 and implemented on July 20. The service clarified on Monday that June 14 was when the service began an earlier phase of their efforts to curtail gun violence. TPS couldn’t say whether the 110 firearms referenced by the chief includes the 78 seized as part of Project Patton – a nine-month investigation that targeted the Five Point Generalz gang. Of those guns, 60 were seized in a single raid from a car that was headed to Toronto from Cornwall, Ont. Police have recorded 233 shootings in 2018, up 9 per cent from last year and 124 per cent from 2014. A number of those shootings have taken place in prominent settings – the entertainment district, Yonge-Dundas Square, a playground – kindling loud calls for action from across the city. Presently, handguns are categorized as restricted weapons in Canada. Would-be owners need to pass background checks, take a two-day safety course, pass written and practical tests and join a shooting club to obtain a permit for transporting the weapon – known as an Authorization to Transport, it essentially allows the owner to take the gun from their safe at home to the shooting range and back. There have been varying reports concerning the source of Mr. Hussain’s gun. It either came into his hands via the continuous flow of weapons smuggled north from the United States or through a domestic source. Police in Toronto have said firearms from domestic sources – which are diverted to the illicit market by theft or by straw buyers who purchase guns legally and sell them to criminals – make up 50 per cent of the crime guns used to commit crimes. It’s unclear if that figure includes all seized guns or solely those police are able to successfully trace.